Playing games with your dog is probably one of the most important things you will do with him. Not only is games fun but what many people don't realize is that games can be really good for your dog's health and well-being. As a dog owner it is important that you know the How, When and Why of playing games with your pet. In this article, I will explain why games are so important and so beneficial for your pet. 1. Playing Games Builds Bonds: Playing games regularly with your dog is a great way to build a strong bond between the two of you. This works best if you are the one in control, you decide when play starts and stops, you bring out the toy etc. If you are the source of fun, your dog will just love being around you and will do everything you ask. 2. Playing Games Reinforces Good Behavior: Dogs are predators, their instinct is to chase, hunt and chew. Now, these instincts have been toned down over hundreds of years but they should not be suppressed completely. If they are, it can lead to unwanted behavior such as being unruly; over boisterous, chewing up everything in your house and your garden! Games are a great way for your dog to reinforce his natural instincts and get it out of their system so that outside of play time they are the model pet that doesn't create havoc in your house. 3. Playing with Your Dog is Great for your Health: Your dog gets so much out of playing games particularly if you make it a daily ritual. But your dog isn't the only one that benefits, games are really good for your health too. The most obvious benefit is that you are getting outside and getting some fresh air and exercise but did you know they are also a fantastic way to unwind and distress? 4. Playing Games Boosts Your Dogs Confidence: Confident Dogs love to learn, explore and try new things. By playing the right kinds of games with your dog you are encouraging him to learn more and you are helping to build your dog's confidence and self-esteem. 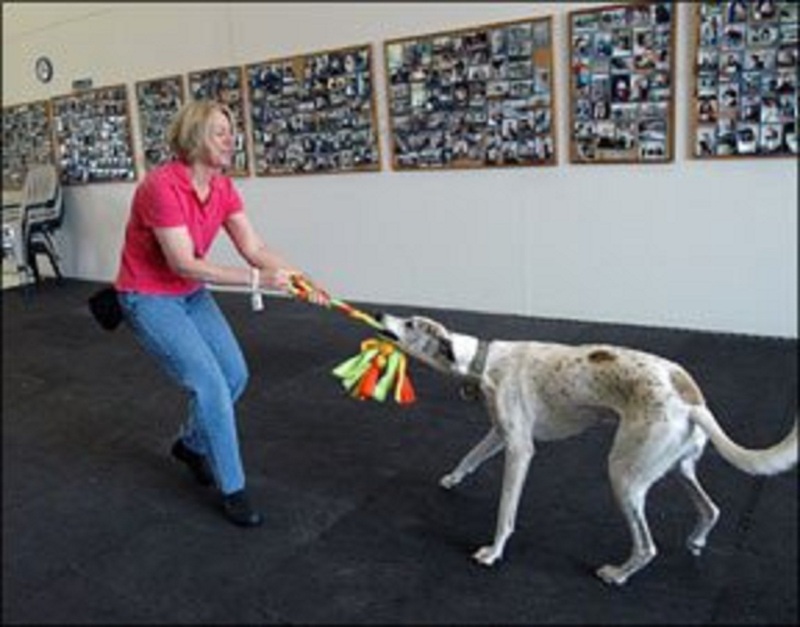 Many games are a great way to train your dog to do something new or to reinforce what he has learned in your more formal training sessions. Games, particularly with a puppy, should start off pretty simple but get more complex as your puppy or dog masters each game and skill. That way your dog's brain is kept active and he is always learning something new and interesting. 5. Games Teach You About the Relationship You Have With Your Dog: Another interesting benefit to playing games with your dog is that you will quickly learn about the type of relationship the two of you have. Is he willing to listen to you and do what you ask? If yes, that's great, your dog looks up to you and respects you. Or does he go a bit wild, knock you over and/or runoff? If the answer is yes then I'm afraid your dog doesn't listen to you and hasn't yet learned to respect you. This isn't your dog's fault, it doesn't mean he's bold it's just a good indicator that he (and probably both of you) needs more training. As we grow from children to adults one of the saddest things we stop doing is we stop playing. We get serious and we forget how to just let go, use our imaginations, play and be silly. Do you ever watch children at play and wish you could be that carefree? Well, now you get to reconnect with your inner child and forget all your grown-up troubles and worries for part of every day. I can't begin to tell you how good that feels and how good it is for your mental health!